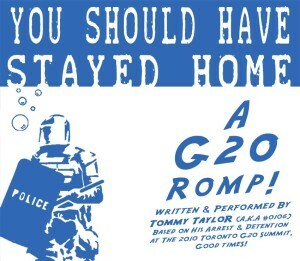 You Should Have Stayed Home (aka #G20Romp) is a play about Tommy Taylor’s experience over 48 hours at the 2010 G20 weekend in Toronto. While trying to return home from his first ever protest as a law-abiding citizen at the “Free Speech Zone” at Queen’s Park, Taylor was swept up in a mass arrest, caged with 40 other people in a ten foot by twenty foot cage and denied drinking water until he passed out from dehydration. 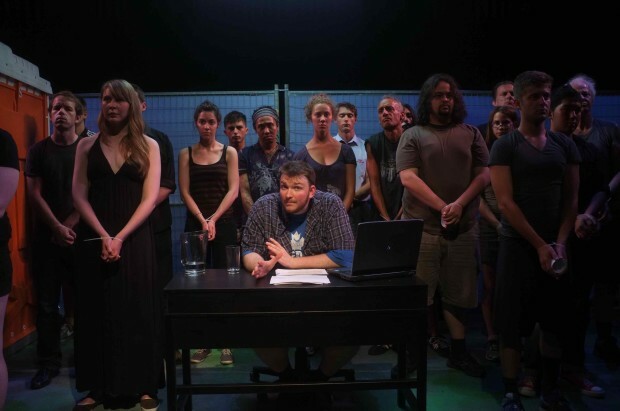 The play is an adaptation of Tommy’s Facebook note, How I Got Arrested and Abused at G20 in Toronto. The note went viral and has been translated into seven languages and appeared in twenty-one countries – a detailed, frightening and often funny account of the largest mass arrest in Canadian history. Tommy’s story has been covered by national and international media, including a Gemini-nominated CBC documentary named after the production. Ottawa, Ontario: Arts Court Theatre, November 20-23, 2013. You Should Have Stayed Home is a one-man piece of storytelling in the tradition of Spalding Gray, with Taylor moving around a replica Eastern Avenue Detention Centre cage as he recounts 48 hours in his life as a citizen on the streets and eventually incarcerated. Part-way through the narrative, there is a scene that incorporates twenty-six participants that can be played by actors and non-actors when the action arrives at a cell in the Eastern Avenue Detention Centre. As the show tours cities across Canada, the company will work with community members in each city as Tommy’s fellow detainees. Praxis is proud to be working with the support of the Canadian Civil Liberties Association, Council of Canadians and the Toronto office of Amnesty International, who will be putting calls out for participants in each of our cities. The production is also running an indiegogo campaign to raise $10,000 through 1000, $10 donations – one for each person summarily arrested during the G20 weekend. 10% of all funds raised will be donated directly to The Canadian Civil Liberties Association.